Who’s the Little Guy at your bonfire party? At LabelsPlus we take our environmental responsibilities seriously and have a particular interest in wildlife conservation. 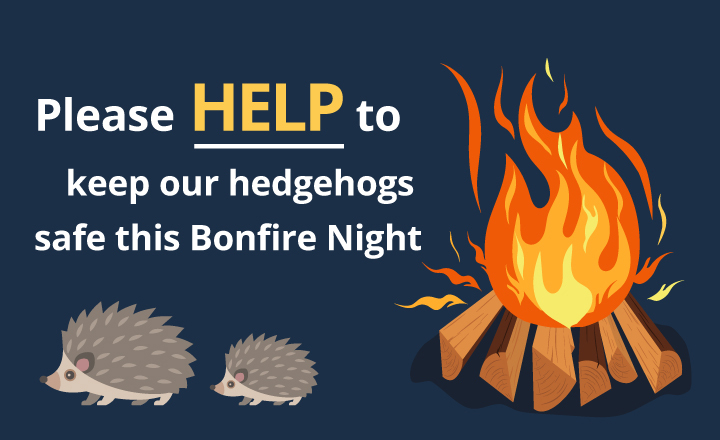 So when we heard that bonfire night can be hazardous to one particular species we decided to share some information about how we can all do our bit to help. The UK’s hedgehog population has declined by around 30% since 2002 and it’s estimated that there are now fewer than a million hedgehogs left in the UK. At this time of year hedgehogs are getting ready to hibernate for the winter, finding somewhere warm and protected to settle in. That causes a problem come bonfire night as those big piles of wood and leaves make perfect nesting places for hedgehogs. Anything we can do to protect hedgehogs at this precarious time of year could make a real difference to their long term survival. Building bonfires on the day you intend to light them – this also reduces the risk of being rained on! If you do store wood and leaves outdoors be sure to move, dismantle and reassemble piles carefully on clear ground to give wildlife the chance to move to safety. Protect large bonfires early in the building of them by placing chicken wire all the way round their circumference. Hedgehogs are good climbers so slope the wire outwards to make it as difficult for them as possible! Light fires from one side to give any hiding hedgehogs the chance to escape. If you do find a hedgehog, move it with as much of its nest as possible (using garden gloves) to a well-ventilated cardboard box filled with old towels or newspaper to keep it safe until the fire is completely damped down. Then release it in a sheltered spot like a log pile or under a hedge. The team at LabelsPlus wishes you all a safe bonfire night but please don’t forget the humble hedgehog.